In like a lion, out like . 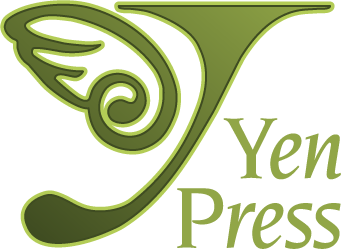 . . a new issue of YEN PLUS! If you plan on attending New York Comic Con this weekend, February 6-8, make sure you stop by booth #1921 and pick up your complimentary copy, courtesy of Yen Press! As always, leave your comments here, and thank you for reading! Hey, love what you’re doing, but, I’d like to suggest something. Please add a light novel series to your magazine for serialization. What I mean is, publish a chapter per issue (or even split up some chapters). I know that personally, as a Light Novel fan, I would love getting the magazine even more if I could read a light novel series in it. And there are plenty of other people I know who DON’T get your magazine, that would feel inclined to if you added light novels. Some manga magazine’s in Japan have light novel series serialized in the back, I think yours should too, even if its just one. What do you think of this idea? Will we possibly see a light novel series serialized in Yen+??? They said it’s gunna come out *SOON* since it’s next month’s issue. yay max ride is back! I’M SO HAPPY NOW!!! THANK YOU YEN PRESS!!!!!!! Oh, and about Matt’s suggestion, I think that would be a a great idea~! Either translating light novels from Japan or having English-language writers would be so cool! Got my new yen plus and Max is back in action! Love the covers and Hero Tales. 3 people are one of the 7 stars of the big dipper, Taitou, Ryuukou, and Koyou. And I finally get to see Dr. Stein and Death Scythe fight together in Soul Eater. This is pretty awesome!! Oh, well that came out…early! Just 2 weeks ago, my local bookstore had Jan on the shelves, then yesterday when I checked back they had switched to March. :/ Now I’ll have to order the Feb issue (cuz no way I’m going to miss my Yen+ xD) and shipping costs to canada = blah. I’d subscribe, but I might be moving soon, don’t want to go through the hassle of changing addresses. as an end note – love the cover, as always! Wah!! How come I still haven’t got my new Yen Plus?! I’ve been subscribed since it started but I haven’t got the March issue yet!! I’m sorry but I really want to start reading it @[email protected] Someone??? I can’t wait to pick up the new issue (I’m assuming my subbie hasn’t kicked in – and with all the problems people are having, I wouldn’t mind being safe)! I LOVE LOVE LOVE the Nabari no Ou cover. So fabulous! The Max Ride cover is pretty sweet too. Ah never mind about my first comment!! I finally got the issue today!!!! Thank you!!! and I’m so sorry about earlier >_<! Why was Yoite changed to Koite? Wouldn’t that change some dailoge especially where it explains why he’s called Yoite? Miya-miya is just tooooo awesome. And though certainly a light novel in this would be wonderful (Higurashi light novels, ahaha), I can’t imagine it would be too successful, light novels don’t seen to do well stateside, anyways. What a shame, since I’d love to see more. Wait, is it an actual chapter from the manga book of maximum ride or just an interview? YAY! I got my copy on Friday and read it all before I went to see Avenue Q yesterday-Yen Plus+Avenue Q=one awesome day!-and loved it! As always, it was a joy to read! Can’t wait for the next Nightschool, Pig Bride, and Sarasah(sp?)! But still I gotta ask for some information on the amatuer contest! Please! P.S. Am I the only one here super jealous of NaRae Lee after reading that interview? Sure, we all know she’s talented, but them to find out she’s super cute as well! It’s just not fair! A light novel running in Yen Plus would be fun. It might also be a good idea to put in preview chapters of your already licensed light novels like you do with your manga. As Benny1 said light novels appear to have a tough time and need all of the promotion that they can get. I wish I knew where NaRae Lee lives, though~ I live in Korea! I think the light novel suggestion is a great idea. I am taking a flash programing class this semester…. it is quite literally torture. Which reminds me- I live in Korea also. And i saw the Maximum ride volume 1 in stores! Still, Narae lee says that her book does not sell in Korea, but it does! but she probably has one? i don’t know– i would just love it for her to know that maximum ride does sell in Korea! I’m always happy to open up my mailbox and find a shiny, plastic-wrapped issue of the latest Yen Plus! Although, I have to make a statement about something, even though quite a few others have already done so. I’m really not too happy about how you guys skipped a chapter of Maximum Ride. I think you said that the artist was taking a break… But why just skip a chapter? The artist didn’t skip making a chapter… Is it so that we buy the book? I’m a bit pressed for money, being that I’m a college student, and this magazine subscription was something that I treated myself to at the beginning of the school year. It saves money compared to buying every issue at the bookstore. I’m disappointed, but not so totally shaken that I’ll stop reading. I can’t wait for more news about the amateur artist’s contest, though!!! Krona and Death the Kid, ftw. Those three Goong previews are killing me. I think I’m going to have to track down the volumes. Got the new issue! Bought Higurashi vol 2! Was not disappointed with either! ^_^ Loving Maximum Ride, Jack Frost and Soul Eater. Please take out Goong… I feel better use of a “preview” section could be used. Nice to see extras. However, “Otaku Pimp” seems a little iffy :\ I did not like it in this issue… and I feel again, like the space could be used better. I STIL NEED TO GET THIS ONE!! I’m devistated. I dont think that Yen plus comes to my market basket anymore, Its now February 22 and I havent seen a lick of Yen anywhere. I got this one in stores awhile ago, and really liked it. Wonderful covers. Though, is it just me or did it come out too early? Because I never could find the February issue in stores, all they had was January, then two weeks later the March one came out. Ah well…Soul Eater and Jack Frost were awesome as always. Augh, now that I see the Yoite cover I feel so sad – I went to Borders today and couldn’t find Yen+ anywhere! I really need to subscribe, I can’t live without Nabari no Ou and One Fine Day! I finally got my copy at Barnes and Noble! I live pretty far away from any bookstores, but I’m visiting my sister in Philly, so I got it! I was wondering the order that other people read the series. I read Soul Eater (my favorite) firstm because I can’t wait for it, and after that I go from least favorite to most. So the order of reading is Soul Eater(yay! ), Time and again(yuck! ), Nabari no ou, one fine day, maximum ride (it would be higher, but since I’ve read the books, I know whats going to happen. ), Hero Tales, Sarasah, Nightschool, Pig Bride, Sumomomo Momomo, and then Bamboo Blade. Jack Frost’s (and Higurashi when it was still there) order changes depending on my mood for creepy. it can be as early as second, or as late as last. I don’t like Time and again at all so far. It seems to be a very depressing and pessimisticd series with alltogather unhappy characters. T&A is the only one the I don’t love. Nabari no ou is good, but it is better suited to books then serialization. Altogether the best magazine ever. @Felix: I read the Korean/English side first inorder from the first advertisments and editor’s not to the last page of manhwa, then flip and read all of the Japanese side, then I check for more info. on the amatuer’s contest, read the previews, and then look at the fan art and read the extra comics. (I’m one of those people who has to read everything cover to cover-even the advertisments unless it’s one of the ads that’s been in every issue, in which case I ignore it.) I read the Korean side first because it’s more shojo and that’s my favorite manga genre. P.S. Can’t wait for the next issue! I LOVE this month’s magazine, with my two favorite series from Yen Plus gracing the covers! I’m so glad Maximum Ride is back this month, as last month’s issue just wasn’t the same without it. I get to enjoy the magazine every day, as I work at a bookstore, and I put it on a display for the Maximum Ride book series. Thanks for the interview with NaRae. She seems so sweet and modest! Give her a big hug for her cover with Iggy & Fang! Iggy is so sweet and adorable, and I feel like he gets overlooked in the books sometimes, so it’s nice to see him on the cover! boo!! anyone else in the UK having the same problem? I’ll still be getting Yen Plus…there’s no way I can stop now! Just a shame…I’m guessing it’s an economy/recession thing? hi i have gotten all yen plus book and so far i think there the best my favorites so far is maximum ride,night school,jack frost,soul eater(the best)bamboo blade,nabari no ou,please show the april cover soon still looking for it as it is march 13th and should be hitting stores within the next week or so cant wait thanks and could u tell of some more suprises i cant wait to see what future issues will bring. Yey Maximum Ride! First, thank you guys so much for bringing this story’s manga to us! One tiny nitpick though, NaRae Lee, fabulous artist though she is, didn’t actually create Maximum Ride. James Patterson did, and I’m sure you know that, but the nit-picky side of my brain won’t let this go. ^_^; Sorry! But once again, thank you! Darn,I really need to convince my parents to get me a subscription ^^;; I want every issue! i love maximum ride how many vols.